Hah. I actually missed submitting my brush max wallpapers. I remembered how I used to love using only brushes to create a soothing but populated background for my anime wallpapers. As of late, I've been keeping an eye out for other people's works and have been following the prevalent styles. I started this piece, simply for fun, and had no plans to release it on MT. It was what I considered not my best work...but since i did have fun toying with it, maybe some of you will like it nonetheless. The image used is a wondeful vector by aNiMe. Without further adieu, heres, my wall! Reason:Its a rather old wall, but the background really caught my eye. Lovely! It's so lively and happy. Interesting combination of brushes as well. The image is not a scan, but rather a vector made by aNiMe. This is very bright and full of energy, just like bell-chan. I often see wallpapers with this image with a dark background, so the bright background blends well and is a nice change. i love the extra touches u've added in the background. the rings, feathers, clouds, wings, and the grid. they all match quite nicely together. 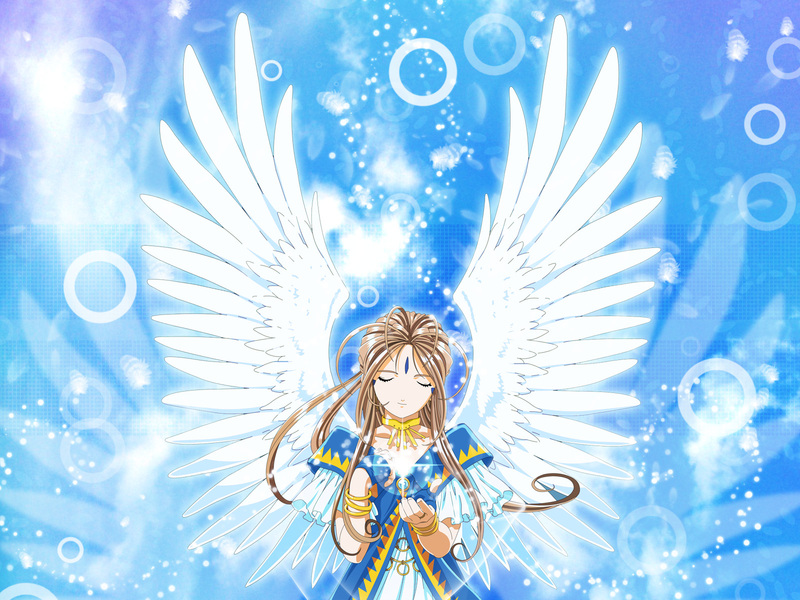 A good wallpaper with nice spaces to put icons & i can still get a good view of Belldandy. Great job. Agreed, the thumbnail doesn't do it justice. Excellent background :) . Great, i loveit. belldandy is do beautiful. the background is great. fantastic. soft looking. great job. I have alwasy loved her she is so pretty. This is a great picture. Great. I really love the cute little blue backround. i love this wall... it's so beautiful!!! it's a really amazing scan and this backround...great! keep it up and thanks for it! I love this picture of Belldandy and the effects on the bachground are great, it makes her look so angelic! Adding this one to my favs!